The 2013 International Women’s Day is a time to reflect and voice out the need to accelerate action to End Violence against Women. NOWSPAR this year takes forward the UN theme: ‘A Promise is A Promise: End Violence Against Women’. Our concern for this is implementation of promises that the government has made to end all forms of discrimination against women and to prevent and address gender based violence. Even though we have progressed as a nation by passing the Anti-GBV Act and signing major UN Conventions, the key issues are the lack of a policy framework that operates at sport sector and sport institutional level, the lack of sufficient evidence from the sport sector for national action and resource allocation and the disconnect between the sport sector and the general GBV mechanism. We call on the sport community to now focus on the establishment and implementation of policies at various levels of the sport sector to prevent, protect and deal with instances of harassment and abuse. Harassment and abuse in the sport area include physical, emotional, psychological and sexual harassment and abuse. Both sexual harassment and sexual abuse are expressions of the greater power of one person over another. Women and girls are more frequent victims of harassment and abuse than men and boys. Many females drop out of sport rather than continue being subjected to the undermining effects of constant harassment and abuse: others endure the sexual attention of their male coaches or peers because of fear, desire for athletic reward, low self-esteem or ignorance of who to turn to for help. Typically, abused athletes keep quiet because they fear that they will either be accused of consenting or of inventing the whole thing. This is not a problem peculiar to sport; it is a reflection of the general situation in our country as a whole. Participants, practitioners and policy makers should speak out against harassment and abuse in the sport sector. Participants should participate in the protection and prevention systems and accept their responsibility and role in dealing with GBV in sport. Participants, practitioners and policy makers in the sport sector should ensure the safety and security from GBV, they should seek to be role models to other parts of society in their diligence in dealing with GBV within sport. There should be increased security and safety from GBV within sport facilitating an increase in equitable participation by both genders, wide variety of age groups and diversity of backgrounds. Participants, practitioners and policy makers should know on what GBV is and how it manifests in the sport sector and the ways it can be prevented. They should further know where to access support to deal with GBV issues and what role they can each play in dealing with this issue. Sport sector should be seen as a proactive and responsible sector that is committed to the safety and wellbeing of its stakeholders and participants. The sport participants, practitioners and policy makers should be recognised as sources of information on GBV within the sector. This will in the long run contribute to safeguarding not just the sport sector, but sport will be used to reach the broader community to prevent VAW and GBV in general. 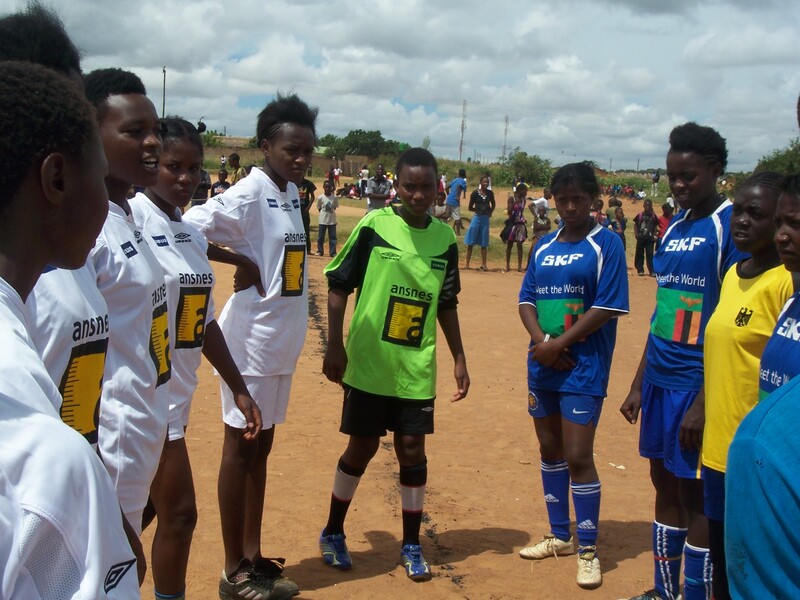 We celebrated women’s day at our 6th Women’s Sports Day to be held in Kaunda Square, Lusaka at 9:00 – 15:00. Activities include netball, football, volleyball and dance.